Ricorditi di me che son la Pia. I daresay that these lines from Dante’s Divine Comedy are more familiar to readers than Donizetti’s opera inspired by this tragic heroine currently being given its first stage performances in the UK by the enterprising English Touring Opera. The plot of the opera is roughly as follows. In an attempt to broker a truce between the warring Guelphs and Ghibellines Pia (from the Guelph side) has been married off to one of the Ghibelline leaders, Nello. Despite the marriage war has broken out again between the two Italian city states – and there is a further complication: Nello’s brother Ghino is madly in love with Pia and is dtermined to have her. But when he learns his sister-in-law is expecting a visitor he gets into a rage because she has clearly rejected his advances in favour of another. He vows to expose her treachery to Nello who in turn becomes insanely jealous – the Ghibellines have a tendency to jump to hasty (and wrong) conclusions it seems – and orders Pia’s execution. In actual fact PIa’s visitor is not a lover but her brother Rodrigo and the truth doesn’t come out until she is dying from poison and Ghino has been slain. Forgive me if I don’t dwell on the subtleties of the story. People go to hear Donizetti because of his music and the performances – or at least in the early 19th century they did. As John Andrews’ programme note explains: “The conventional formality of the operas was in fact a strength rather than a weakness, allowing a first time audience to negotiate the plot and emotional arc of the story through familiar forms.” There are several instances in this work of an aria followed by a cabaletta – a slow exposition, a transition and then a faster and more emotionally intense finale. A good example in this opera is in Act One where the incarcerated Rodrigo begins by bemoaning his fate, but on learning that his escape has been arranged he bursts into an outpouring of joy and excitement at the prospect of being reunited with his sister. Mezzo-soprano Catherine Carnby handled this role with great sensitivity and was utterly believable. I’m not sure that the latter comment applied to the two Ghibelline characters, but the blame must lie with Donizetti and his librettist Salvadore Cammarano, not the performers. Both composer and librettist had to make changes to their productions along the way in order to comply with the requirements of theatre managers and the law, so the result was sometimes a mishmash. Luciano Botelho as Ghino had an especially thankless task: not only was his character unsympathetic, but he had to shoulder the lion’s share of the first scene before the company and orchestra got into its stride. Still he displayed plenty of swagger and arrogance as he plots to bring down his brother. What a contrast to his demeanour in the Second Act when he learns of his error regarding Pia’s visitor; here he is genuinely contrite and sings a ravishingly tender duet with Pia begging her forgiveness (‘Per sempre dai viventi’)! Grant Doyle as Pia’s husband Nello comes over as a man of action who is easily duped and can become a danger to others when his rage gets out of control. Australian Doyle has a magnificent baritone voice, looks the part and turns in a powerful performance throughout. Such is the array of Australian vocal talent within in the ETO’s ranks that one feels tempted to rename the company Australian Touring Opera! The star of the evening also hails from Australia. Elena Xanthoudakis’ Pia was absolutely stunning. Rarely have I heard bel canto sung to such perfection, notably in her cavatina ‘O tu che desti il fulmine’ in which she faces up to the pain and conflict she has to bear with nobility and self-control. Even Boccaccio’s Patient Griselda cannot hold a candle to her. Elena has a flawless, seemingly effortless bel canto technique coupled with an excellent stage presence – and I can’t wait to hear her again. A hallmark of Donizetti’s operas is the prominence of the chorus, and choral singing is one of ETO’s strengths. There is some splendid ensemble singing; in one case the singers transform them themselves from fierce Guelph warriors to self-flagellating hermits at the drop of a hat. The orchestra showed plenty of spirit driven on by the youthful looking John Andrews. The set was adequate: I have the impression it was the back of the scenery used in the other operas ETO are performing, and shall be able to test out my theory when I review Don Giovanni later this week. Once again James Conway and English Touring Opera have justified the public subsidy and private support they are receiving by reviving an opera which is virtually unknown rather than sticking with familiar repertoire. And they have come up trumps with Pia de’ Tolomei. 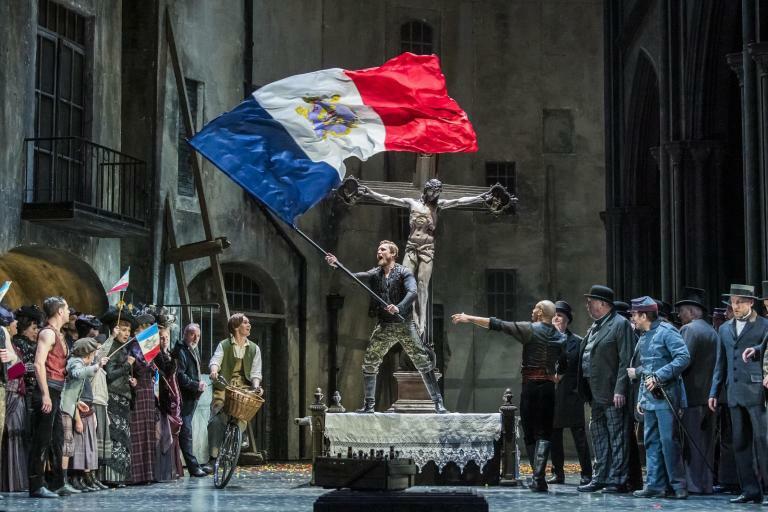 English Touring Opera continues its tour to Buxton and Cambridge (April); Crawley, Canterbury, Wolverhampton, Blackpool, Durham, Perth, Exeter and Leicester (May); York, Stoke on Trent; Ulverston and Carlisle (June). For details of performances see www.englishtouringopera.org.uk.